Mikhail Spiridonovich Gvozdev (Russian: Михаи́л Спиридо́нович Гво́здев) (1700-04 — after 1759) was a Russian military geodesist and a commander of the expedition to northern Alaska in 1732, when the Alaskan shore was for the first time sighted by Russians. In 1732, together with the participants of the first Kamchatka expedition navigators Ivan Fedorov and K. Moshkov, Gvozdev in Sviatoi Gavriil (St. Gabriel) sailed to Dezhnev Cape, the easternmost point of Asia. From there, after having replenished the water supply on 5 August, 'Sviatoi Gavriil' sailed east and soon came near the American mainland at Cape Prince of Wales, Alaska. They charted the north-western coast of Alaska and mapped their route. By doing this, Fyodorov and Gvozdev completed the discovery of the Bering Strait, once started by Dezhnyov and Fedot Popov and continued by Bering. Subsequently in 1741-42 Gvozdev participated in an expedition led by Alexey Shelting, and mapped most of the western and southern shores of the Sea of Okhotsk, as well as the eastern shore of Sakhalin island. A cape on Sakhalin island is named after Gvozdev. ^ Igor V. Kapustin. "Иван Федоров и Михаил Гвоздев - ivki.ru/kapustin/ - Арктика Антарктика Филателия". Ivki.ru. Retrieved 2013-05-13. ^ "Гвоздев Михаил Спиридонович. Биография. Первооткрыватели и исследователи Камчатки. Камчатский край, Петропавловск-Камчатский — краеведческий сайт о Камчатке". Kamchatsky-krai.ru. Retrieved 2013-05-13. ^ "Map of the New Discoveries in the Eastern Ocean". World Digital Library. Retrieved 10 February 2013. This article about a Russian physicist is a stub. You can help Wikipedia by expanding it. The Bering Strait is a strait of the Pacific, which separates Russia and Alaska slightly south of the Arctic Circle at about 65° 40' N latitude. The present Russia-US east-west boundary is at 168° 58' 37" W. The Strait is named after Vitus Bering, an explorer in the service of the Russian Empire. Semyon Ivanovich Dezhnev was a Russian explorer of Siberia and the first European to sail through the Bering Strait, 80 years before Vitus Bering did. In 1648 he sailed from the Kolyma River on the Arctic Ocean to the Anadyr River on the Pacific. His exploit was forgotten for almost a hundred years and Bering is usually given credit for discovering the strait that bears his name. Big Diomede Island or "Tomorrow Island" is the western island of the two Diomede Islands in the middle of the Bering Strait. The island is a part of the Chukotsky District of the Chukotka Autonomous Okrug of Russia. The border separating Russia and the United States runs north-south between the Diomede Islands. Aleksei Ilyich Chirikov was a Russian navigator and captain who along with Bering was the first Russian to reach North-West coast of North America. He discovered and charted some of the Aleutian Islands while he was deputy to Vitus Bering during the Great Northern Expedition. 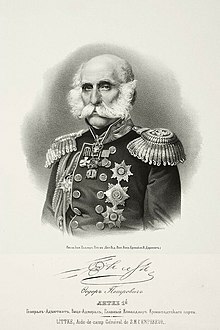 Kurbat Afanasyevich Ivanov (Russian: Курбат Афанасьевич Иванов, was among the greatest Cossack explorers of Siberia. He was the first Russian to discover Lake Baikal, and to create the first map of the Russian Far East. He also is credited with creation of the early map of Chukotka and Bering Strait, which was the first to show the yet undiscovered Wrangel Island, both Diomede Islands and Alaska.